I should know by now not to mind the terrible covers on Diana Wynne Jones books. That said, if there’s one thing I know about my bookish self, it’s that I’m incredibly snobby about cover art. So, even though I trust her storytelling implicitly (and explicitly, for that matter), I was put off by this ugly cover and didn't read Enchanted Glass right away. I now wish I had, because in this middle grade fantasy Diana has created a marvelous story, characters and place, and I can see that I’ll be returning to visit its magic again and again. Something is rotten in the village of Melstone. Aidan Cain has had the worst week of his life. Creepy, sinister beings want him dead. What's a boy to do? With danger nipping at his heels, Aidan flees to Melstone, a village teeming with magic of its own. There he is taken in by Andrew Hope, the new master of Melstone House, who has some supernatural troubles too. Someone is stealing power from the area—mingling magics—and chaos is swiftly rising. Are Aidan's and Andrew's magical dilemmas connected somehow? And will they be able to unite their powers and unlock the secrets of Melstone before the countryside comes apart at the seams? Is it quite clear that I loved this book? I’ll tell you why, then. 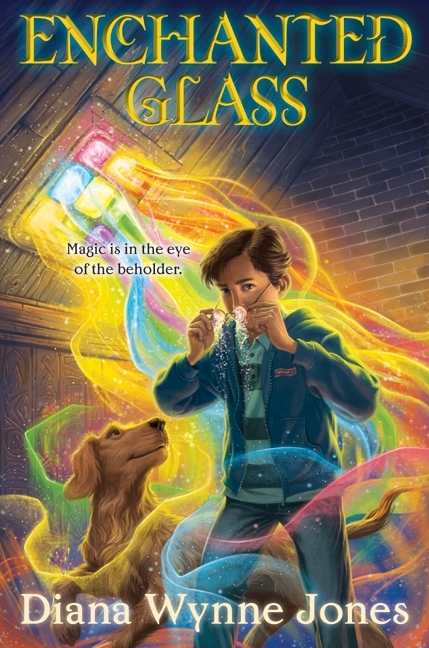 Enchanted Glass is a double story: it follows thirty year-old professor Andrew Hope and a quite young (12? 13?) Aidan Cain. Andrew has been given a task, but isn’t quite sure what it entails. Aidan is being chased by dangerous not-humans. They each have magic, and they are each drawn to Melstone House… But what are they to do about Aidan’s predicament, and what is Andrew’s inheritance that he can’t find or remember? Unraveling these mysteries will take all of the courage, concentration and luck that both Andrew and Aidan can muster. It is a challenge that will change Melstone, and their lives, forever. What that summary doesn’t convey is the charm and wit and rightness of Jones’ writing. While there’s always a ‘something large and potentially world threatening’ going on in the background, the characters live very much in the moment, and their actions feel real and justified. Those characters are also authentic: if they’re smart, they’re often blind to a particular problem. If they seem simple, there is something hiding beneath the surface. And even the side characters are never, ever extraneous to the story. That is why a story about a small, magical village feels important and true and beautiful, and why I love Diana Wynne Jones’ writing. If I must find something to pick over, it’s that there aren’t any female main characters in this story. But there is generational diversity (old, young, in-between!) and species diversity, and most importantly, the end result is a magical tale masterfully told. Recommended for: all ages, fans of fantasy, fans of Diana Wynne Jones, and anyone who liked J.K. Rowling’s Harry Potter and the Philosopher’s Stone. Oh wow. Sounds well written. Great review. I should read more DWJ. I wasn't big on the few I read. Liviania: DWJ divides readers a bit. Until you find a book of hers you ADORE, it all seems 'okay, well, that was fine, but what's the big deal?' My turning point was The Merlin Conspiracy, and I also loved Howl's Moving Castle. Didn't love the Dalemark books or the Chrestomanci books even half as much, and was a little iffy about Fire and Hemlock, which I just read. But this one, and those two I mentioned earlier? Cozy and wonderful, and rereads for always. As for this story, it's one of my favorites and I loved it more on second read ... I hope you do too! The English cover is so so so much attractive (not that that's hard....). I bought that one instead! Oh, Cecelia, I want to have a DWJ readathon right this instant, because you remind me just how magical her writing is. I love that she does atmosphere and character so well. Like, I remember falling head over heels in friendship for Sophie Hatter. I imagine that I'd love the characters of Enchanted Glass as well. Also? DWJ totally gets the shaft when it comes to covers. What a shame. No female leads? What about Stashe, Mrs Stock (no relation), even Titania? Ninelifeddgog: I consider a 'lead' character to be one who has a viewpoint and considerable stage time in the story. While Stashe, Mrs Stock and Titania get *some* stage time, it's not nearly what Aidan or Andrew get, and there aren't any scenes (that I recall) from their points of view, either. That said, I would never call a DWJ book unfriendly to female characters! It was just something to mention in passing in the case of this book. Hope that helps you understand where I was coming from, and thanks so much for the comment!